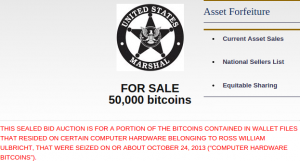 For the second time ever, the US Marshals will auction off stolen bitcoin. The first time this past summer, the US Marshals auctioned of nearly 30,000 BTC that were on the servers of the Silk Road online marketplace. Now, the US Marshals are seeking bidders for 50,000 of the ~144,000 BTC that belonged to Ross Ulbricht. Ulbricht, as you may recall, has been arrested for allegedly operating the Silk Road marketplace on the Tor network. Forbes reports, “While he has pleaded not guilty to seven drug trafficking, money laundering, computer hacking, and ID theft charges, Ulbricht says he is the owner of the Bitcoin on his computer,” adding “If Ulbricht wins his court case, he will receive the money obtained in the auction. 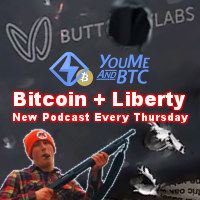 If he loses, the money will go to the Department of Justice’s asset forfeiture fund, Donahue explained.” This process of selling seized property without a criminal conviction is known as civil asset forfeiture, though unlike most instances of asset forfeiture, Ulbricht has been charged with a crime. By contrast, the Australian government waited to obtain a conviction before announcing they plan to auction seized bitcoin. Coindesk reports, “Australian law enforcement officials are now in possession of 24,500 bitcoins following the conviction of their original owner… Richard Pollard.” Pollard plead guilty to commercial drug trafficking and was sentenced to 11-years in prison. Coindesk adds, “Pollard’s bitcoins are subject to a restraining order and a 28-day appeal period. Should the funds be forfeited to law enforcement officials as expected, the bitcoins will then be sold at auction by the Victoria Department of Justice.” And, like Ulbricht, Pollard allegedly had connections to the Silk Road, though unlike Ulbricht, Pollard was accused of being a seller on the site. What do these auctions and possible auctions mean for the future of bitcoin? Some people, according to Coindesk, hailed the first US Marshals auction as boosting bitcoin’s credibility. I disagree, though don’t assume I’m saying that the auction of stolen funds diminished the credibility of bitcoin. The fact that at least two government agencies have seized (and one has auctioned) stolen bitcoin does not directly affect the credibility of the items stolen and auctioned. Bitcoin has credibility despite being stolen and sold by governments. Bitcoin has credibility because it can be used as a medium of exchange, and unlike government backed currencies, it is traded voluntarily and without the force of The State (see footnote). Saying that governments give credibility to bitcoin by auctioning ones they’ve stolen, is akin to saying governments give credibility to murder by having hired men commit those actions! note: The State – capital T, capital S – is a coercive monopoly. The State has monopoly control over the use of coercive violence in a given geographical area. 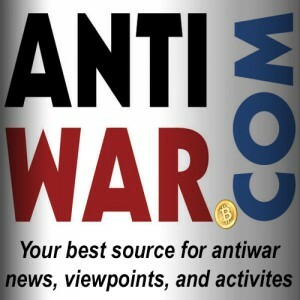 CryptoThrift’s “Important Announcement” And My Response Roger Ver to match $10,000 of bitcoin donations for AntiWar.com, again!